If you come from the Southern States of America then this is a dish you’ve probably grown up eating, but it’s made it’s way into the hearts and plates of people all over the States, and for good reason – it’s darn delicious and comforting, a warm hug on a cold night. If you’ve never had this before it’s best to describe it as a mix between a thick soup and a stew, almost casserole like. The star of the show being the delicious broth that’s strewn generously with shreds of chicken, herbs and peas. Dumplings are dropped into the thickened liquor towards the end of the cooking time where they plump up into soft pillows of goodness. It’s winter here in Sydney and it’s been pretty chilly lately, especially once the evening draws in and I can’t think of a better dish to come home to on a cold night than this. 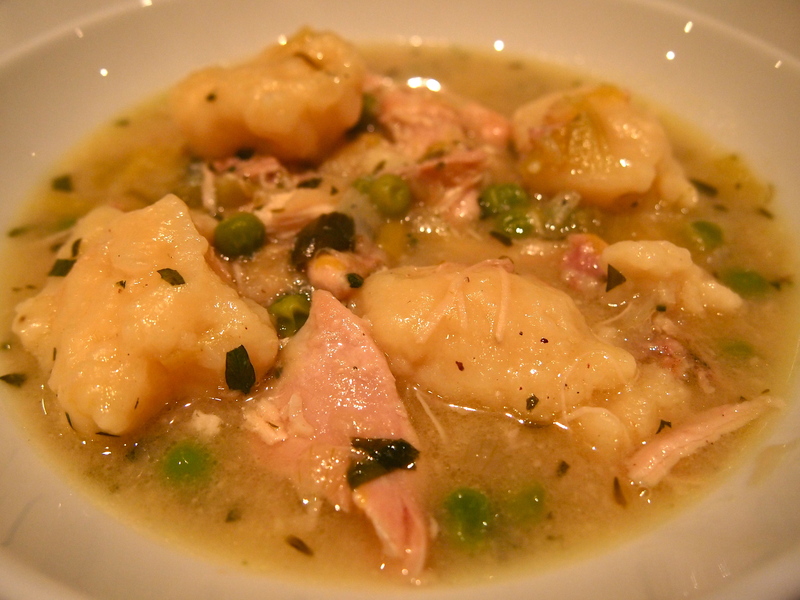 There are a lot of variations on cooking chicken and dumplings, ranging from the complicated to the ready made where store bought roast chicken and packet biscuit mix is used. I’ve tried the former and made my own chicken stock for the broth, using a whole chicken which I’ve then shredded and used in the final dish, but the recipe below is slightly less time consuming without compromising the end result. In fact, I think I even prefer it. This an updated version using leeks and tarragon which isn’t traditional but it works a treat. The dumplings are an important element in this dish and they need to be light and not too stodgy. Out of all the recipes I’ve tried, the one below yields plump dumplings that have just the right texture and lightness. The size of the dumplings is personal preference but I don’t like them too big and use about a tablespoon for each dumpling but you can certainly make them bigger if you wish. Pat the chicken dry and season generously with salt and pepper. Heat the oil in large saucepan or dutch oven (A large le Creuset is ideal) over medium high heat. Add the chicken pieces (in batches if required) and cook until golden brown on both sides. Transfer to a plate and set aside. 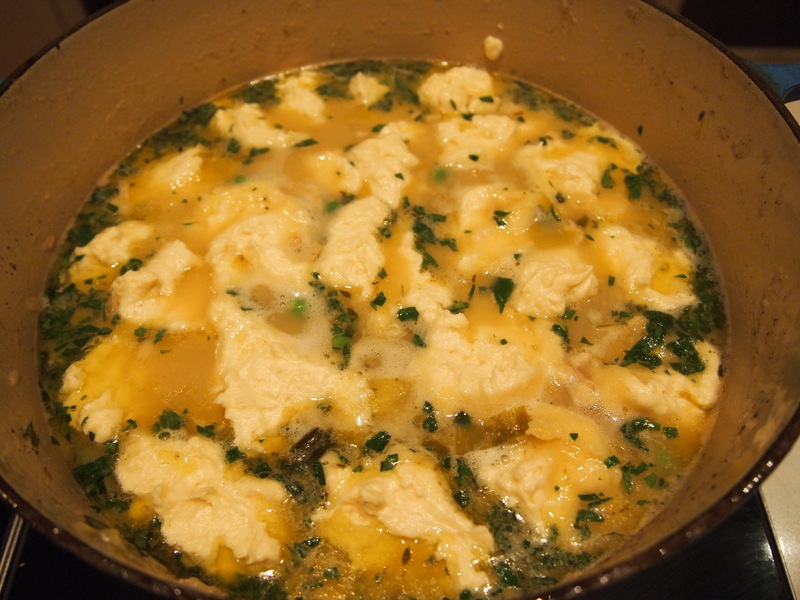 Pour off the chicken fat and reserve for the dumplings. Add the butter to the pot and return to medium heat. 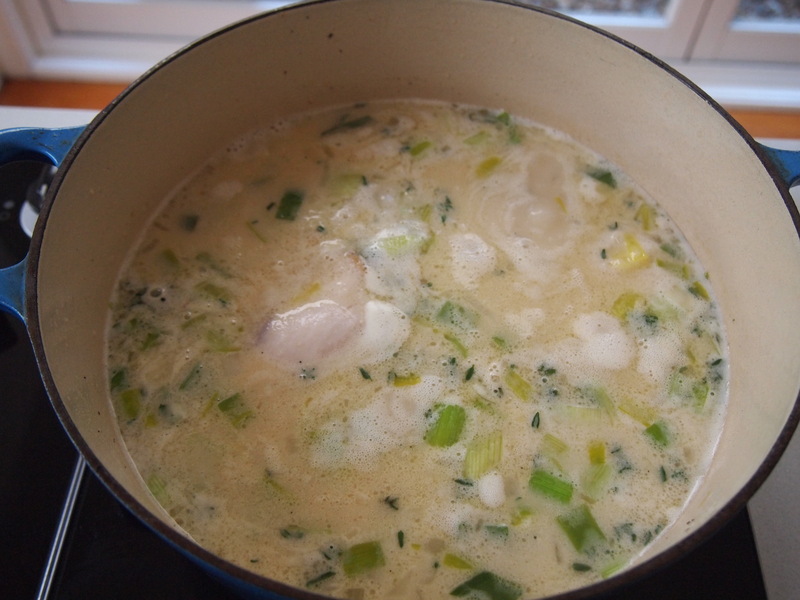 Add the leeks, onion and celery along with a ¼ teaspoon of salt and cook until softened, about 7-10 minutes. Stir in the flour, whisk in the sherry, scraping up any browned bits. Stir in the stock, milk, cream, thyme and bay leaves. 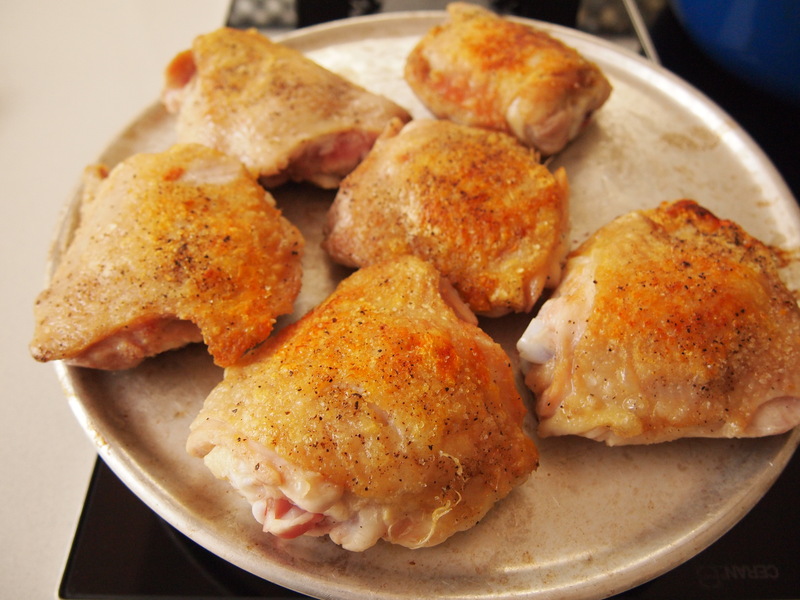 Remove the skin from the chicken and discard. Nestle the chicken pieces, with any accumulated juices, into the pot. Cover and simmer for one hour. Transfer the chicken to a cutting board. Discard the bay leaves. Allow the sauce to settle for a few minutes then skim the fat from the surface using a wide spoon. 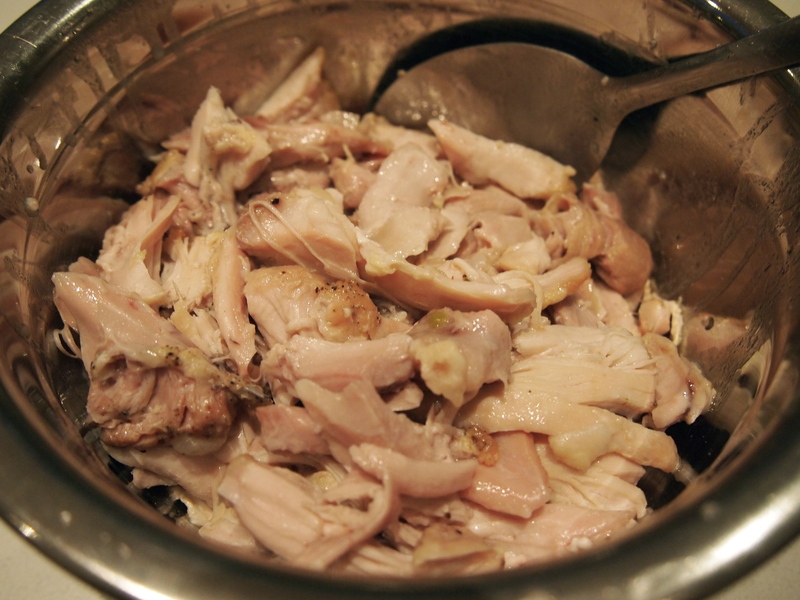 Shred the chicken, discarding the bones, then return it to the stew. To make the dumpling, stir the flour, baking powder and salt together. Microwave the milk and the chicken fat (or butter) in the microwave until just warm, do not overheat. 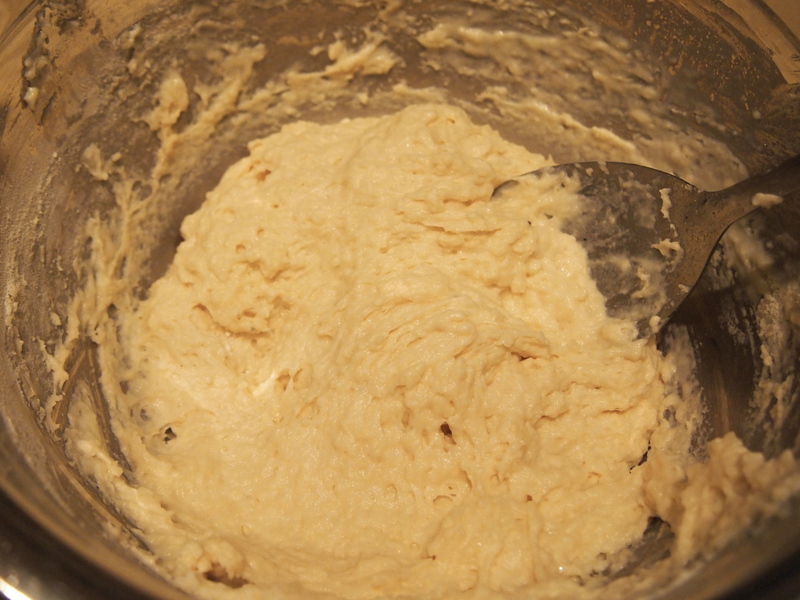 Stir the warmed milk mixture into the flour with a wooden spoon until incorporated and smooth. 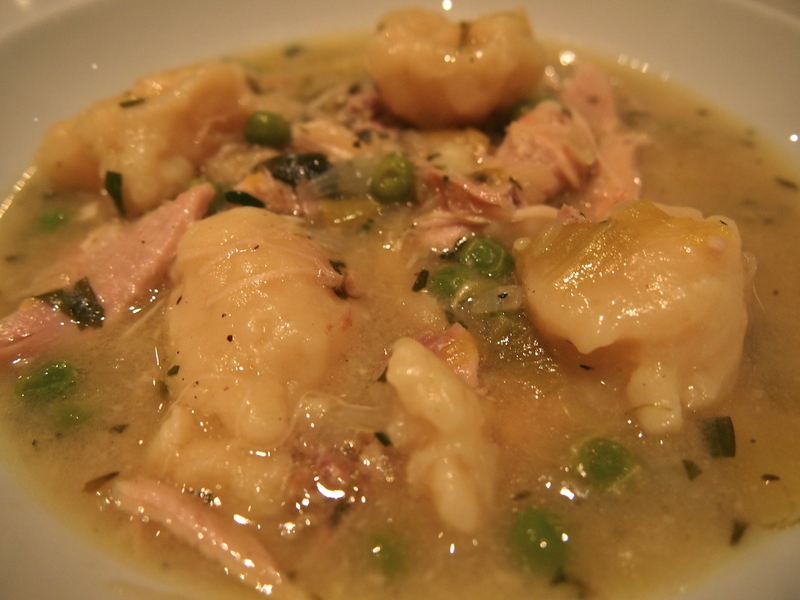 Return the stew to a simmer, stir in the peas and tarragon and season with salt and pepper. 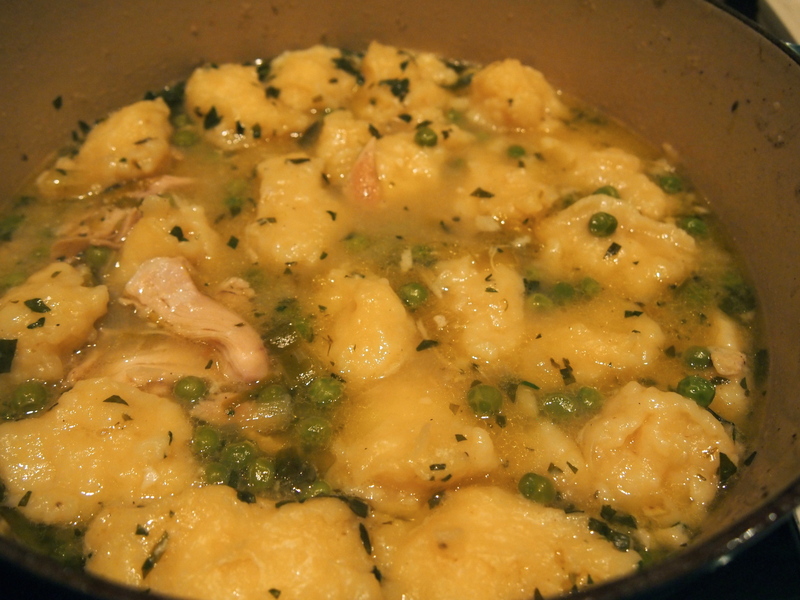 Gather a portion of the dumpling batter onto a soup spoon, then push the dumpling onto the stew using a second spoon. Cover the stew with the dumplings, leaving a small amount of space between each (when fully cooked the dumplings will double in size). Reduce the heat to low, cover and cook for 20 minutes by which time the dumplings will have doubled in size and cooked through.